When Julia Morton, a teacher at Arnhill Academy, kills herself and her young son, Ben—with no explanation other than the cryptic sentence “Not My Son” written on the wall—Joe Thorne realizes he has to go back to the town where he spent his early life. Joe doted on his little sister, Annie. When she disappeared, he was frantic, but that wasn’t the worse part. What came next was more horrible. A short time later, Joe is in an automobile accident. His father and Annie are killed and Joe is left with a limp and the knowledge that what happened was no accident but was deliberate. That’s why he returns to Arnhill. His teaching record isn’t the best. Neither is his life. So he forges a resume and recommendations. The school accepts them, and he’s back where he started, in a little coalmining town where the only thing one wants to do is escape. He meets again the people he knew as a child: the rich boy bully with his following of thugs, the girl he loved who loved the rich boy—they’re the same but different. One’s still privileged, still swinging his weight around. One’s dying. Others are absent, like his best friend, who threw himself from the roof of the school one morning. Their son is a chip off the old block, even more obnoxious than his dad. Joe runs afoul of Junior his first day of teaching. A few nights later, a brick is thrown through his window. He’s attacked and beaten by Stephen Hurst’s grownup bully-boys. Things at home are no picnic, either. He rents the house where Julie and Ben died, and the nights spent in it are anything but peaceful. As now, there wasn’t much to do in Arnhill when Joe was young. He and his buds spent a lot of time exploring the old cemetery and the now closed mine. Odd thing about the graveyard. There are no children’s graves. Odder thing about the mine. There’s a hole in the ground with an iron ladder attached leading into a back entrance, and inside are images on the walls, symbols and perhaps words, and the floor is littered with what could be bones, lots of them. There’s a presence lurking in the dark, a thing demanding something only the most desperate is willing to give. Joe thinks someone gave it Annie, and years later, another someone offered Ben. He fears another sacrifice will be made soon. Oh yes, there’s another reason Joe came back to Arnhill. He owes a great deal of money to the wrong person, and that person has set a stone-cold but beautiful hit woman on his trail. He’s got a very short time to prevent another disaster, another Annie and Ben from happening, and then get himself not only out of town but out of the country before the deadline the lady with the gun has given him runs out. In spite of being written in the irritating first-person present point of view, this is a gripping, definitely creepy story. As Joe attempts to protect the child he believes will be the next victim, the storyline alternates between present-day Arnhill where he copes with adult versions of childhood acquaintances while at the same time grappling with memories of what happened between the time Annie was found and the auto accident. The sense of dread hovering over the entire story becomes thicker and more desperate as Joe realizes his time is running out. Joe is neither a good man nor a bad one. He’s simply someone who sees a chance to right a terrible wrong and decides to take it. There’s a flaw in his plan, however, and a definite shocker when he learns where he made his mistake and how wrong he’s been in his judgment. 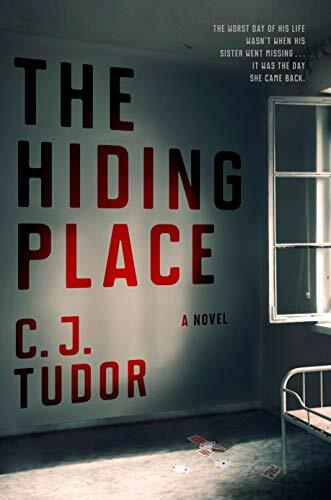 Like C. J. Tudor’s other novel, The Chalk Man, The Hiding Place has enough shocks and twists to keep the reader off balance until the last page.